The distance for Moclin to Alcalá la Real? 20+km. Not too steep or otherwise difficult except….. Finally I met Benedo again. Finally! He texted me to ask if was here. I’d been looking for him. The other lot of apartments is supposed to be closed, according to my book. They aren’t! He is staying there so that sorted out who was where nicely. He is a lovely teddy bear. Was so nice to see him again. As usual, in the only bar in town. 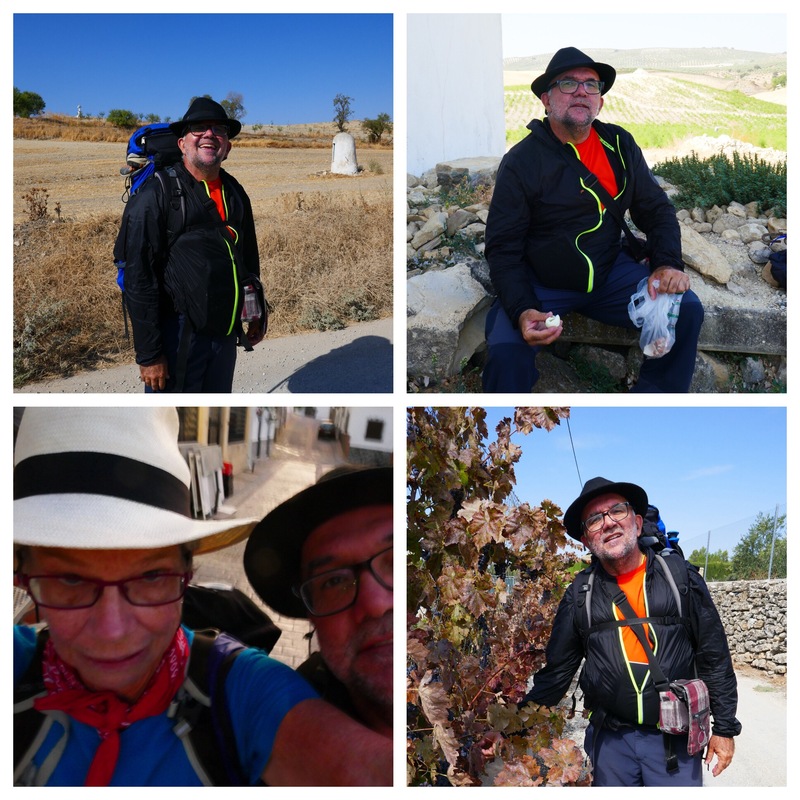 He has to be tired, getting into Granada late last night from Las Canarias and walking well over 30km today. He got lost, not surprising given the lack of signage, of yellow arrows pointing the way. And then it must have been very tiring to climb a very steep hill up to Moclin at the end of the day. Manolo has prepared a booklet for them both with maps, details of accomodation and towns. Fills in the gaps in my booklet. Hmm, there must be a decent Spanish language version of mine that I missed. Oh well. If all goes well we’ll walk further than towards Córdoba than either of us had planned. Or, we’ll catch a bus as we’d both previously planned. I’d forgotten how hard Benedo finds it to slow his speech for me but he is also patient and seems willing to tell me the same thing multiple times in different ways. He likes talking, making him a good companion. And good practice for me. Was very tiring listening to him today, trying to get my ear in again. My feet are holding up so far but, I’ve only walked two days. Given my toe surgery in July I’m happy so far. And the choice of Keens Targhee II was inspired. Better than the runners I wore last year. Those were too slippery on the marble bits on the streets of Granada and the Keens weren’t, plus, they feel solid on some tough terrain. So far they are not eating toes on either foot. Time will tell. Combined with the Skinners, my feet are happy. For once. Ok. We arrived at about 13:00, having left at about 08:00 after coffee. After a steep exit from Moclin it was pretty flat and generally not steep for long. We saw watchtowers on many of the surrounding hills. A constant reminder of the history of the area: armies coming through again and again and people needing to watch out for possible invaders. Lots of asparagus growing in this section, looking a bit sad in places as it is so so dry. 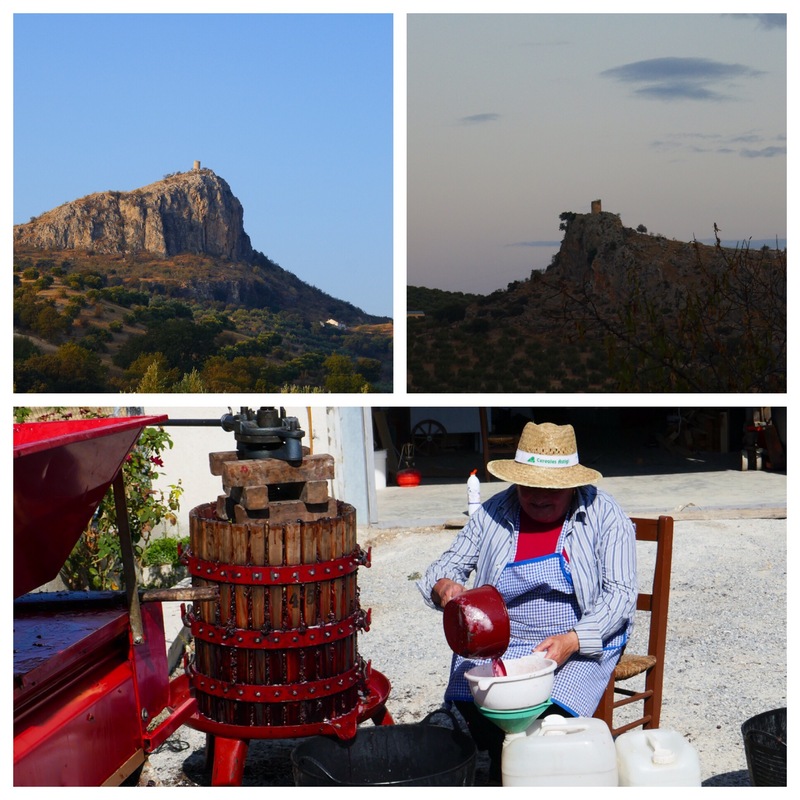 We walked through small towns, on short bits of scary roads and through olive groves. Lots of fruit trees and nearly all looked sad and very dry. The blackberries are also dried up memories of fruit. Sadly. At one of the small blocks a group was making wine, pressing the juice and putting it in containers. Leaving their dear little pup, a young Yorkie, wasn’t easy. He’d have fitted in my pack. We walked and walked, expecting coffee at about mid morning. No such luck. We did the whole distance on eggs I’d hard boiled yesterday and water. Oh, and 1 Pepsi Max. Benedo stops and drinks every time we walk past a water fountain that doesn’t have the not-potable sign. A good habit. At the start of the day I was gradually understanding more and more of what he was saying. Then I reached saturation point. During lunch in Alcalá I barely understood anything he said. Funny, it’s clear I have real limits. Get tired and my capacity to understand goes. Rapidly. To near zero. Tonight we are in a hotel in Alcalá la Real, a town with an impressive castle. We could see it from km away and then not again until we were almost on top of it as we’d arrived. Four Spaniards left moclin a little after us and have arrived at this hotel also. Lunch was not exciting: soup followed by things with chips. Vegetables? None but I didn’t choose the mixed salad, the often horrible iceberg lettuce one. I should have. Ugh. Must go and look for B. Think he’s being polite and waiting for me to shower and wash my stuff. I finished ages ago and stayed up in the room to blog. And to enjoy silence and thinking in english. And no, he’d gone up to the castle. I went last year and loved it so I hope he enjoys it. I’m sure he told me he was going to do it but, as I say, my comprehension dropped to about zero at lunch.